Hello again! Where does the time go? I have been swamped all week and feel like I’ve gotten nothing done. Someone please tell me I’m not the only one that feels like this….pretty much all the time!!! So anyway, remember last week I showed you all the beginning of my laundry room remodel? 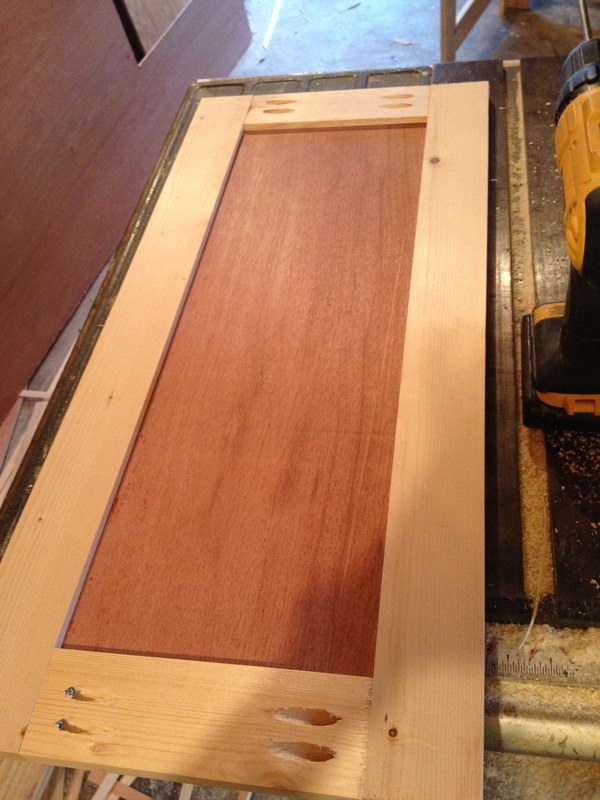 Well, I still had to make cabinet doors for the big cabinet that I built. 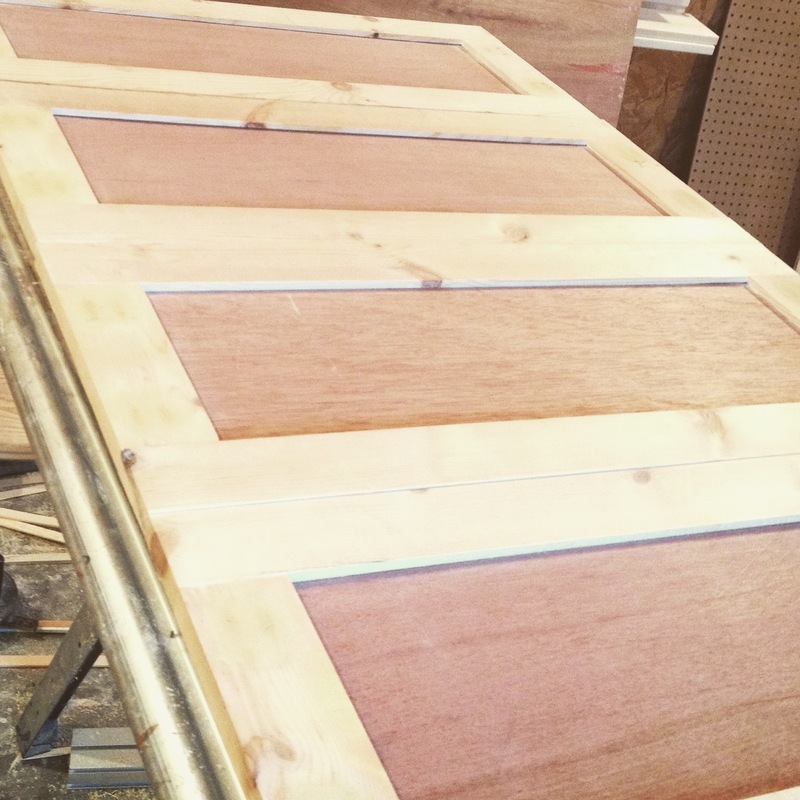 And while I was at it, I needed to make two doors for a cabinet I have been working on for a friend. This post contains affiliate links. If you purchase from one of these links, I may receive a small commission at no extra cost to you. Thank you for supporting this site so I can continue to provide free content. See disclosure policy for more details. Because I was painting, I used spruce (or whiteboard) planks for the frames and luan for the panel (it’s like the cheap of the cheap 1/4″ plywood). If you want to stain, I recommend getting a hardwood or a very smooth pine plywood and matching wood type 1x3s. 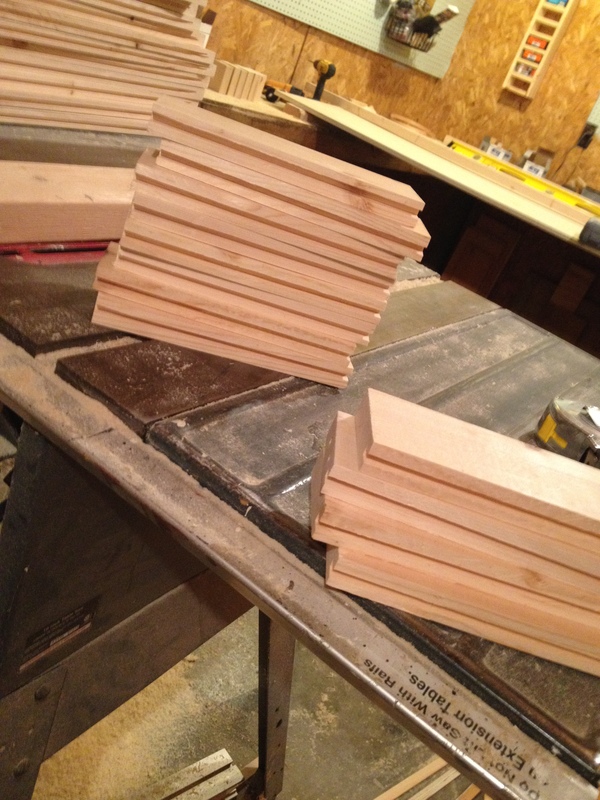 I ripped 1x6s on my table saw to make the 1x3s, but you can buy 1x3s at the local home improvement stores already cut. Take the total width the door needs to be and subtract 5″. 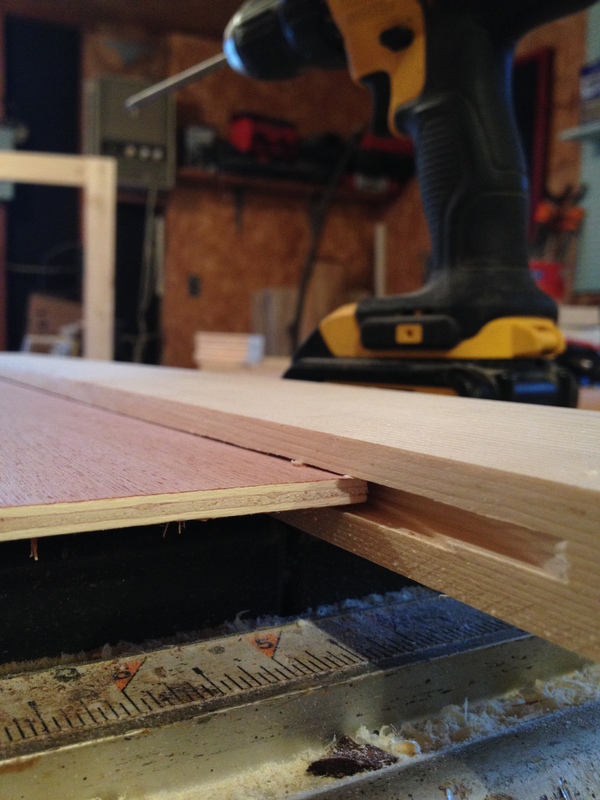 (NOTE: Make sure your 1x3s are actually 2 1/2″ wide. This is standard, but make sure you double check. If it isn’t, then subtract 2 x the width of your 1×3 instead of the 5″ I said earlier.) Cut two 1x3s this length. Next, take the total height the door needs to be and cut two 1x3s this length. 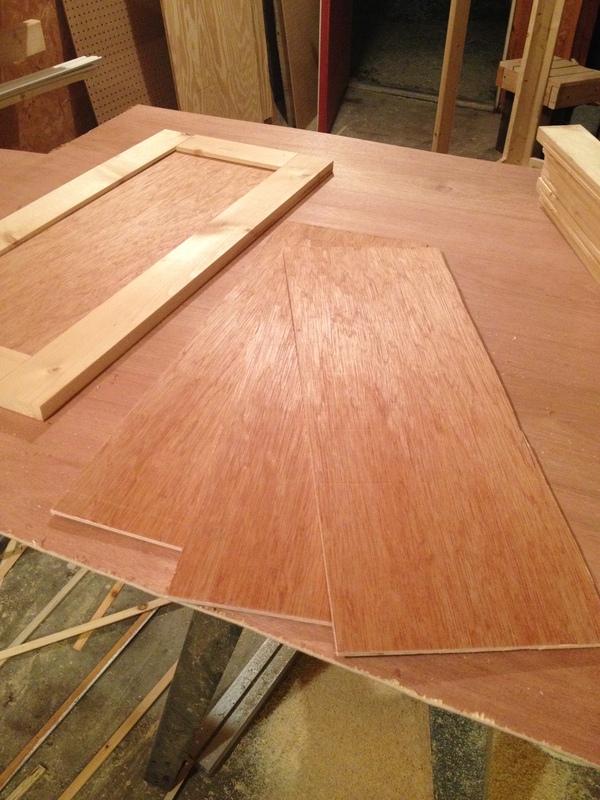 Cut these frame boards for all the doors you need to make so you can do the next step with all the boards at one time. Now, you will set up your table saw. 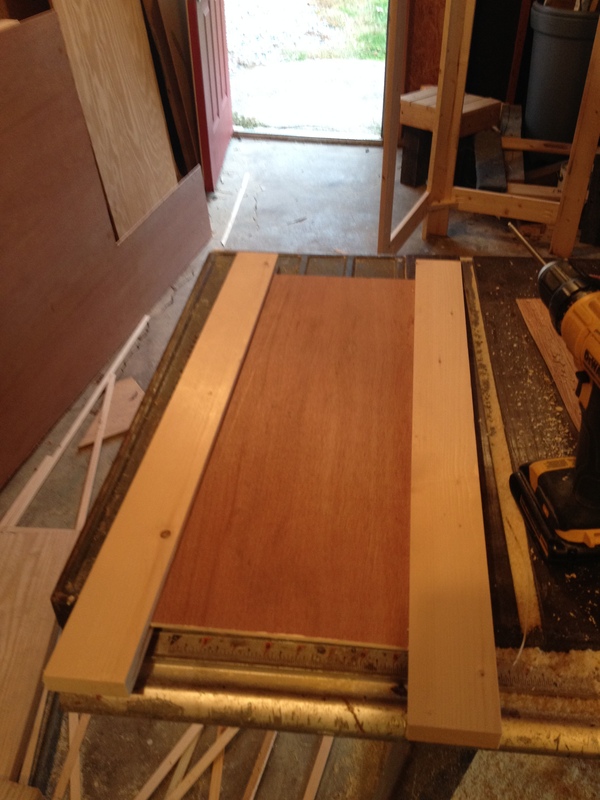 You could also use a router for this step, but I figured the table saw was easier to set up for this. If you have a dado blade, it will save you time, but I do not, so I just do it this way. Place a piece of 1/4″ plywood flat next to the blade and adjust the height until it is BARELY above the top of the plywood. You want the blade to stick up only about 1/4″. Adjust your rip fence to about 1/4″ to 5/16″ from the blade. My rip fence is broke, so we clamped a 2×4. You gotta do what you gotta do, right? Look at Danny in this picture…I was going to crop him out, but I left him because he’s so funny. I’m sure he’s telling me to be careful taking pictures so close to the table saw even though it is off and the switch is on the other side of the table. He’s the safety manager around our house. Anyway, you will run all the short boards through the saw like the picture above–cutting all the way from one end to the other. Then you will turn it around and run it through again so that when you are done, both sides of the board will have run along the rip fence. 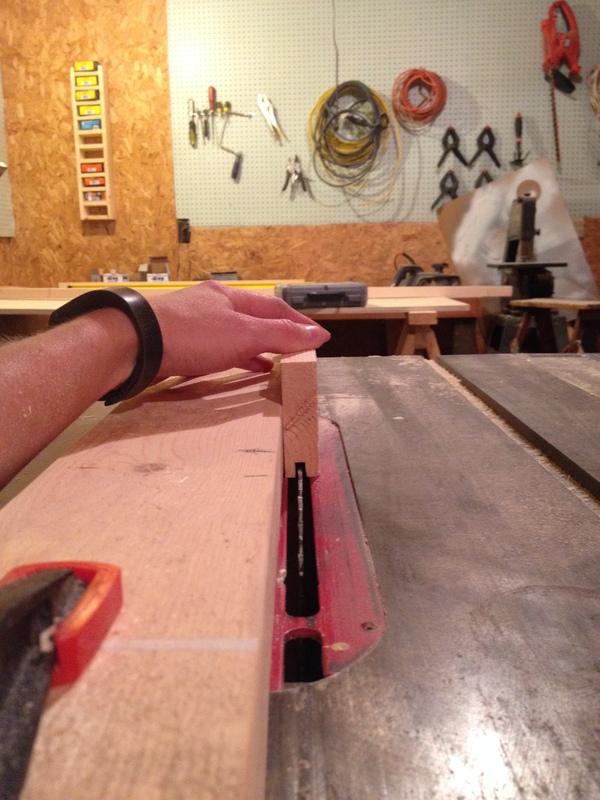 Here’s the deal: You need to cut a groove big enough to slide the 1/4″ plywood in. Your blade is ABOUT 1/8″ wide. You’re trying to cut 1/8″ from the center on each side. Does that make sense? We made a mark on the 2×4 rip fence we were using to show us where to start and where to stop cutting. Just carefully push the board down onto the blade and run through until you need to stop then lift the board away from the blade. You could run them through all the way if you want and just putty the holes once they are assembled. You’ll see in a minute. Do this the same as the short boards…run one side, then flip and do the other. You can see the marks we made in the picture below. I usually end up having to run the boards through on each side THEN adjust my blade again slightly to cut out a small section left in the middle. 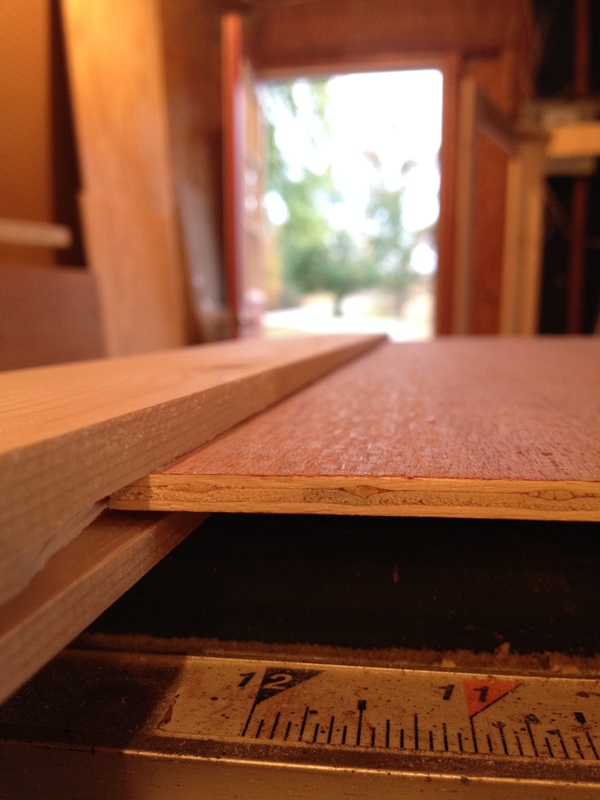 Just adjust and cut until your groove is large enough to fit the plywood. 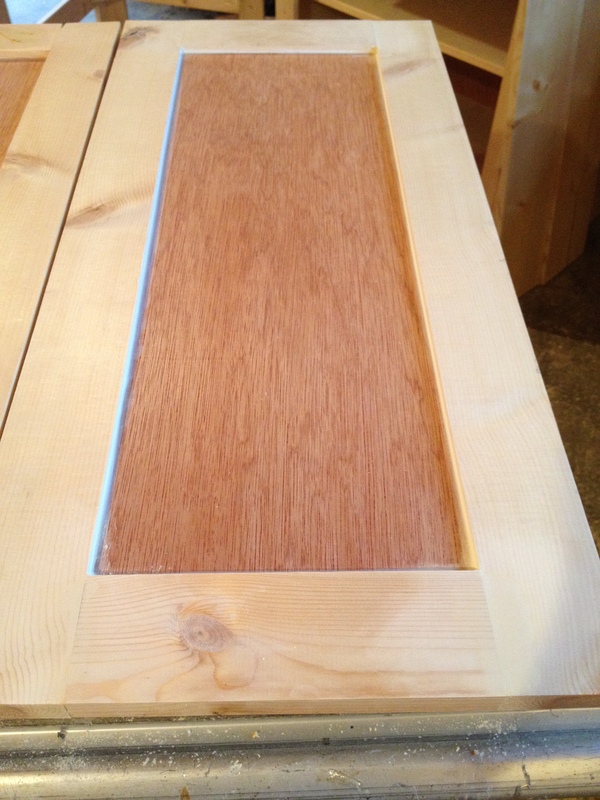 When you cut it, make sure the grain in the plywood is going to run up and down on the door panel. It will look better this way. Dry fit it together to make sure everything will work. Adjust as needed and cut the rest of the panels. Here you have two options: glue or screw. That is the question. I typically glue because it saves time later, but you can use a Kreg Jig and pocket hole screws if you’d rather. It will just require a lot of putty. Place the plywood in the grooves of the sides and liberally squirt glue along the inside of the top and bottom (where the top and bottom 1x3s will go). Then slide the top and bottom 1x3s in place and clamp. Clamp tight, but not so tight that the door bows. Wipe excess glue off. OR you can drill pocket holes in the top and bottom pieces and screw in like the picture shows. Allow the glue to dry (if you used it) and sand and putty (and sand again once the putty is dry) all the joints and the pocket holes (if you used pocket holes). 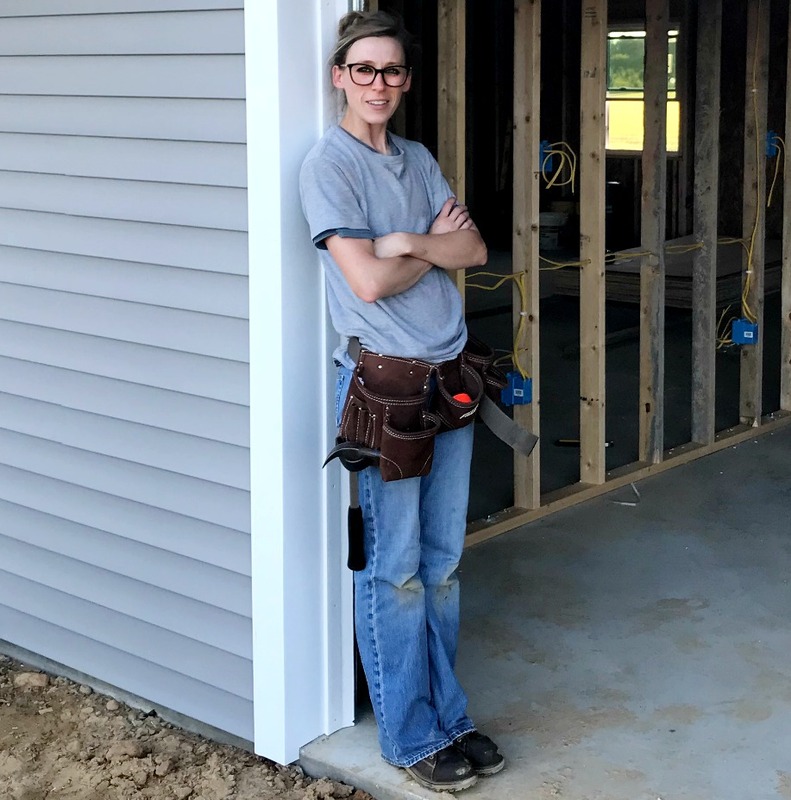 Also, if you are painting, run a small bead of caulk along the inside corners of the front of the door where the plywood goes in the grooves. This serves two purposes–keeps the panel in place so it doesn’t slide around, and conceals any gaps and makes for cleaner painting. It takes forever for the putty in the pocket holes to dry–be patient! Like the pot calling the kettle black–I’m the worst at patience! Once the putty has dried, sand everything smooth and prime. I recommend two coats of primer (on both sides). I also recommend sanding after priming and before painting. Everything gets so much smoother and feels so much nicer. Just a quick light sanding is all it takes. I wish I had taken my own advice when I redid my trim in my house. Trust me…I learn from my own experience. Here are the finished doors for my friend’s cabinet. Looking good, right? I obviously make these doors all the time. Simple, stylish, and quick. I know this is super long and detailed. I wanted to make sure I was clear on instructions. And I still probably wasn’t….but I hope you all will give it a shot and tell me how it goes for you! It’s a little time consuming, but it’s a rewarding project. Because now you can hide the mess in your cabinets with super cute doors that you made yourself for a few bucks 🙂 Now get to building! Awed by your ability and gumption! 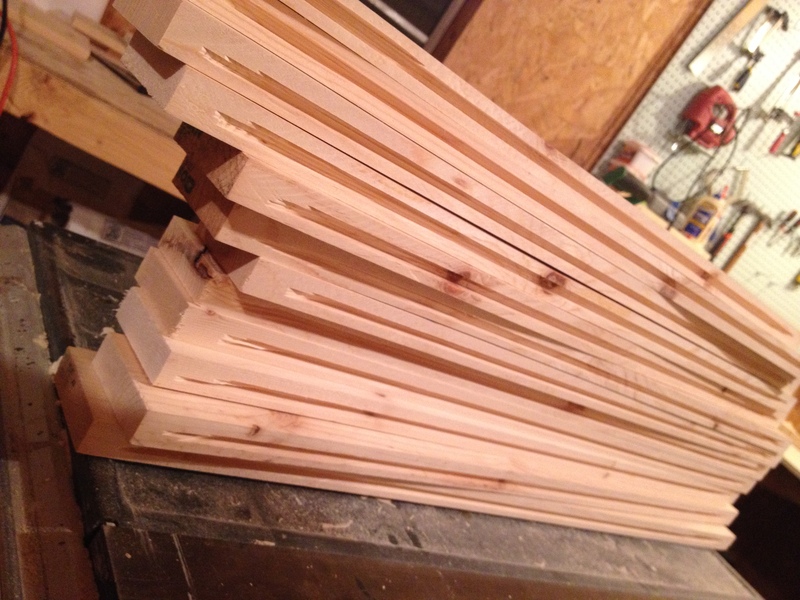 One comment — may cabinet making neighbor told me to not use glue in the slots for the luann sheets, to allow the panels to shift as the frame wood expands and contracts. Thank you! That is a good point. I do not glue my panels into the slots, either. I only glue the frame together and allow the panel on the inside to “float.” I try to cut the slots so that the fit is snug, so the panel will not move easily, but can move as the wood expands and contracts. 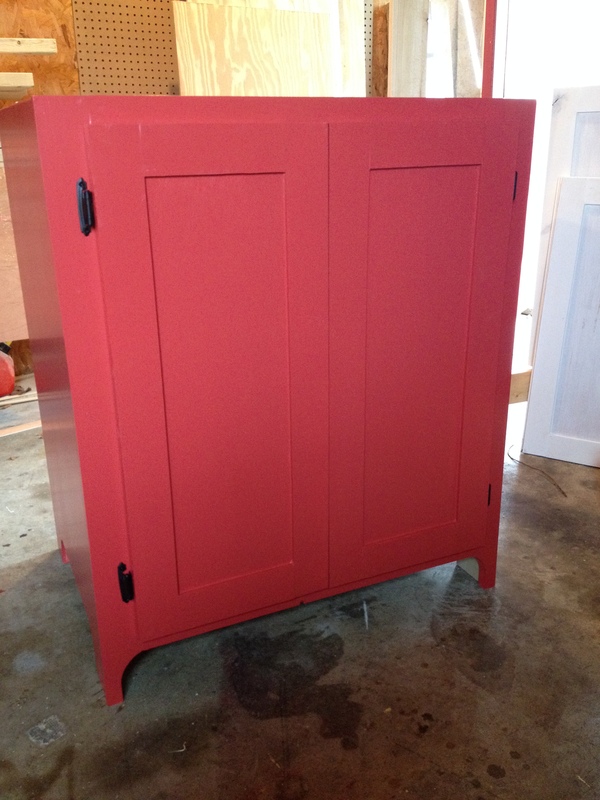 How did you make and fit the hinges on the shaker doors. There are a million types of hinges you could use with these. You would install each a little differently. Usually they come with instructions for installation. But for the hinges I used in my laundry room cabinets, I just screwed them onto the back side of the door, lined it up on my cabinet opening and attached the hinges making sure I had even spacing around the door to the edge of the cabinet face frame.